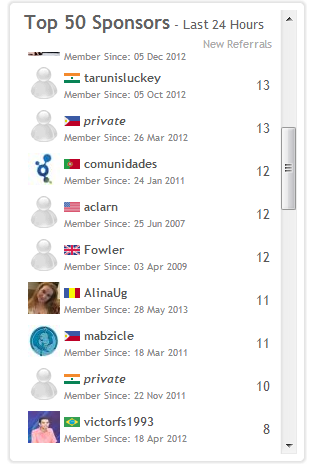 This is quite amazing feeling for being one of the top 50 sponsors in a PTC site like Clixsense. Likewise, I am bit surprised too that i got new referrals in a day. Honestly speaking, i dont really take serious on this. However, with this, i am able to continue using this service. While making LARGE money online is very difficult to achieve but it needs proper execution, effort and persistence. But you could have an ads worth of $0.01 and $0.02 for 15 seconds or 30 seconds respectively. I had to be VERY HONEST to you, usually i only got 20 micro ads and 1 worth with $0.01, so if you calculated it you could take years to cashout(minimum of $6). However, there's a formula to earn more and bigger. ***Note that ClixSense is a TRUSTED and LEGITIMATE website since 2007. Once they have registered you will EARN commissions whenever they click PTC ads, completed tasks and offers, purchase advertising and their referrals upgrades. So if you have 1000 referrals, and they click ads then you could earn $100-300/day. The question is how to get more referrals? It is pretty difficult to look referrals and some friends will not USE your affiliate link to register, but, before that, it is proper to know that SPONSORS could upgrade your account and those adding more ads to click and other features. For now, i was on the top 50 sponsors, with a 11 referrals within a day and had a total of 110 active referrals. In future, i would really want to upgrade all of MY referrals, they should have to enjoy clicking ads, ClixGrid game, complete tasks and offers. How to Earn Money Online: Its Free!